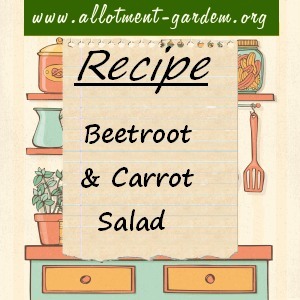 We have grown some lovely beetroot this summer and have looked for alternative ways to eat them other than plain boiled or pickles and chutneys. I remember having this many years ago but couldn’t remember the recipe so tried to make it from memory and it’s delicious! Just mix everything together. It actually improves if you can let it sit for a couple of hours or even overnight to let the flavours merge. I’ve used an orange instead of a lemon before and you could add apple for a variation. Serve with other salads or on its own. Delicious with brown bread and butter! Serves 2 but easy to double up. This is delicious, healthy and easy to make – no cooking!